In this article, I’m going to show you how to write an IELTS essay. I will try to make it as simple as possible, yet totally comprehensive. It is my hope that by the time you finish reading this (and watching the attached video) you will be able to write a really good answer to an IELTS task 2 question. I make no promises like “GET A BAND 7!! !” because it is impossible to make such claims. The IELTS exam will test your English ability, and there are many factors that will contribute to your score. However, if you follow this guide completely, you give yourself the best chance of scoring highly. The first thing you need to know before you even begin writing an IELTS essay is to know the basic requirements of the exam. In IELTS writing, you have one hour to write two pieces of writing. It is recommended that you spend about 20 minutes on task 1 – which for academic IELTS is a report on a graph or map, and for general IELTS is a letter – and the other 40 minutes should be spent on task 2. For task 2, you will be given a question. It will usually provide a statement of sorts, followed by a specific task like giving your opinion, discussing advantages and disadvantages, or explaining problems and solutions. You need to write at least 250 words, following the instructions very carefully. You will ultimately be assigned a grade based upon the IELTS marking rubric. Your grade will be from 0-9, and should accurately reflect your writing ability. However, some problems like stress or sickness may cause you to perform worse than usual, in which case you would be unlucky to receive a grade that does not accurately reflect your level. 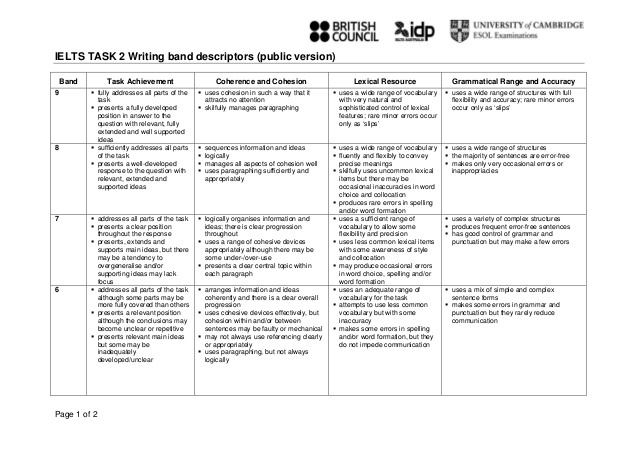 I would recommend reading the marking rubric in order to understand what the examiner will look for in your essay, and so that you can understand why you were given the grade you received. It is very common for students to score highly in reading and listening, and then get a comparatively low score for writing. Knowing the rubric will help you to understand. I will just spend a short time letting you know how to prepare for IELTS writing because actually there are lots of materials on this website to help you do that. The first and most important thing is to make sure that you have a good grasp of grammar and vocabulary. Together, these make up 50% of your writing score, and they are the prime reason why so many students get low scores. These can take years to learn, whereas the other components can be mastered more easily. You should look at lots of previous questions from the exam, as well as reading some sample essays to get an understanding of what is expected. Don’t try to memorize the questions or answers, as this won’t help you. However, pay attention to the structure that the writer uses, as well as the tone with which he writes. You should try to have a teacher or another expert grade your essays and give you feedback on your structure, grammar, and so on. This is the best way to let you know what you should work on in your own time. If you like, I offer a writing correction service that can help you identify your strengths and weaknesses, and therefore give you a good chance of IELTS success. When you go into the exam room, you will probably feel quite nervous. This feeling is a big problem for students in all sorts of exams, so you need to be prepared to deal with it. Stress is difficult to cope with, but you can employ some breathing techniques or mental strategies to help you. Perhaps most importantly, you should be prepared for the exam. As I mentioned briefly in the section above, there are many ways to prepare for IELTS. In general, the more prepared you are, the better your chances of success. This sort of preparation can help you overcome most of your nervousness. I recommend doing lots of practice tests prior to the real exam so that you are not surprised by anything. When you see the question and begin writing, you should feel that this is something you have done before. If you are surprised and feel that it is a very new experience, your nervousness will become worse. In the exam room, sit down and steady your nerves. Breathe deeply and think confident thoughts. Try to practice mindfulness, which involves pushing away negative images without worrying too much about them. After this, you will be ready to start. Now we come to the actual question. If you have done lots of practice for IELTS writing, you won’t be very surprised by what you read. Although the questions are always different, they are very similar to one another. There are only a limited number of question types, and a predictable range of topics. These topics come up a lot, but sometimes they are mixed together. For example, the topic of society is often mixed with environment or education. You should make sure that you are familiar with these topics and learn some useful vocabulary to adequately discuss them. This should help you for both speaking and writing. It is tempting for experienced IELTS students to sit down and start writing quickly. This happens because you read the question and it seems familiar. Knowing that you have just 40 minutes to write an answer, you launch into your introduction immediately. However, this can be a big problem. I have worked with some really talented students who have made some incredible mistakes. They see the question and recognize some words, so they jump to conclusions. As a result, they score very poorly for Task Achievement – which is worth 25% of their total score! Instead, you should take two minutes to carefully read the question. Highlight the keywords and microkeywords that tell you exactly what to do. Only when you are completely sure of your answer should you begin planning and writing your essay. Today, the high sales of popular consumer goods reflect the power of advertising and not the real needs of the society in which they are sold. Looking at this question, we can immediately see that it is an opinion question. We can also see the topic (society) and the main focus of the question (consumer goods/ advertising). It would be easy to misinterpret this question, so you need to think about it carefully. You can’t just begin writing about advertising and society, or about why some consumer goods are popular. Instead, you need to find the relationship between these parts of the question. Do you agree that advertising is the reason why luxury items sell more than essential items? For me, I see the words “popular consumer goods” and I think of iPhones and Nike trainers. When I see “real needs of the society” I think of food, medicine, and schoolbooks. Why do iPhones sell so well compared to the sandwiches at my local shop? Is it due to advertising? That is my analysis of this question. You see, it is perhaps more complicated than a quick reading would suggest. You need to practice analyzing questions like this so that you can do it quickly. It could be a huge mistake to rush into writing and not analyze the question, but it is also a problem if you spend too long doing it. Try to do this in about two minutes. Once you understand the question, you need to figure out some ideas to actually write down. Keep in mind that the IELTS exam is primarily a test of your English ability, so you don’t need to be an expert on any one topic. However, you do need to be able to demonstrate some capability in terms of logical thinking for Task Achievement and Coherence and Cohesion. You should be able to at least think of some sensible answers to the question, and to justify them with explanation or examples. It is ok to think of lots of ideas, but before you begin writing, you should definitely choose the best ones to focus on, and get rid of the rest. If you have too many ideas, your structure will quickly fall apart, and you may even run out of time. Generating ideas for IELTS writing is something that troubles many students, especially under genuine exam conditions. You should practice doing this at home, logically ordering your ideas in terms of relevance and how well you could develop them. Failing to do this often results in a person beginning to write and then running out of things to say, or going off-topic. Both of these could be disastrous. I have a whole article about generating ideas that you can study when you have some free time. I mentioned earlier that it can take years to get competent at English grammar and to build up a good enough vocabulary to write a decent essay. Thankfully, it takes hardly any time to learn how to structure an essay! As grammar and vocabulary are worth 25% of your writing grade each, it makes sense to devote a few days to studying essay structures in order to ace this crucial part, which is also worth 25%. If you performed poorly in grammar, for example, you might be able to redeem yourself with a great structure, thus balancing out your score. A high score for two categories can balance a low score for the other two. IELTS WRITING: SHOULD I WRITE 4 OR 5 PARAGRAPHS? Introduction Introduce the topic, perhaps by paraphrasing the question, then give an essay statement. 2-3 sentences. Body paragraph #1 Main argument or one side of the debate. In the case of problem/solution essays, present the problems. 4-5 sentences. Body paragraph #2 Either secondary argument, solution to a problem, or the other side of the debate. 4-5 sentences. Conclusion Summarize your essay and affirm your standpoint on the issue, if necessary. 1-2 sentences. When planning your essay, you should note down this sort of structure to ensure that you remember what you want to write about, develop each point intelligently, and do not stray off-topic. If you do this, you will greatly increase your chances of a high score for Task Achievement and Coherence and Cohesion (combined 50% of your total writing score). It should be abundantly clear that many of the popular consumer goods that dominate markets around the world are not items of objective importance, but rather ones of purely superficial appeal. People need things like food and clothing, as well as some items that enable them to work or travel, but certain products are just luxury items. Take, for example, the iPhone. There are countless other devices on the market that can fulfill the main functions of an iPhone without the jaw-dropping price tag. However, in almost every country, people want to own one of these status symbols. The reason is simply that it has been marketed well, and owning one makes a person look successful and wealthy. It is possible to do this differently, of course, according to the question type or your writing style. However, each sentence should follow on logically from the previous one, building up a coherent argument or point of view, and centered around the main idea of the paragraph. Once you have planned your structure and you are confident about building up paragraphs logically, you can begin to write. You should write slowly and carefully, but try to leave time to actually finish. If you don’t finish your essay, you will have points deducted from your score. Additionally, you also want to leave yourself time to edit your own essay after you are done writing. As globalization sweeps the world in the twenty-first century, people appear to have become more materialistic. Expensive consumer goods produced by companies like Apple and Nike are sold in all corners of the globe, and for many people they are must-have items. Some people believe that this is all down to advertising rather than actual necessity. This essay will argue in support of that position. It should be abundantly clear that many of the popular consumer goods that dominate markets around the world are not items of objective importance, but rather ones of purely superficial appeal. People need things like food and clothing, as well as some items that enable them to work or travel, but certain products are just luxury items. Take, for example, the iPhone. There are countless other devices on the market that can fulfill the main functions of an iPhone without the jaw-dropping price tag. However, in almost every country, people want to own one of these status symbols. The reason is simply that it has been marketed well, and owning one makes a person look successful and wealthy. If the real needs of society were reflected in sales, rather than the popularity of certain luxury items, our economies would look very different. Fashionable brands would not be as wealthy as ones making affordable, simple products. Yet it is those items that are carefully advertised on TV, on the internet, and at sports events, which captivate people and cause them to make unwise purchases or form irrational brand loyalties. Look at how Apple overtook Microsoft, or how Nike easily outsells any humble, local shoemaker. In conclusion, it is clear that sales are dictated not by a product’s necessity, but rather by its appeal to consumers, and this appeal is created through slick advertising campaigns. This is a video of me writing the above essay. I talk for quite a while about the question. If you have already read this whole article, you may find it unnecessary, in which case you should probably skip ahead to me actually writing the essay. When you are finished, leave a few minutes to look over your work to find mistakes. Editing one’s own work is extremely difficult, even for professional writers! However, you should have a checklist of things to find. Look for commonly misspelled words and grammatical errors that you often make. You can learn these things by getting expert feedback on your writing. Pay attention to your tenses, punctuation, and to subject-verb disagreement. Remember to review your articles (a/an/the) and prepositions. These are all mistakes that are easily fixed. At this stage, it is too late to make any structural changes, so it is worth spending that extra time at the beginning of the test to get that right. As for word count, a properly planned essay will almost certainly reach 250 words, and if you have done lots of practice, you will know what that looks like. Don’t waste time by counting in the exam, as it can take a long time. Get a feel for the length of your essay during your practice tests, and in the real exam you will just know – as the examiner does – that it is either more than or less than 250 words. The most important thing is to use language correctly. In other words, you might attempt to write a long sentence filled with difficult words, and completely fail. The examiners might not understand you at all. You think that it’s impressive, but he or she thinks it shows you do not speak English very well. It is, therefore, better to use only what you are 100% confident you can use correctly. If possible, try to vary your sentence length. Native speakers do this intuitively, and you can pick up this sort of rhythm by reading often. If all your sentences are the same type and length, it would sound quite boring. Finally, remember to stay calm and be confident. IELTS might seem like the most important thing in the world, but it is just an exam. Unless you are extremely unlucky, you will get the grade that you deserve. There is no shortcut or cheat to getting a high score, and you should not waste your time or energy even thinking that way. Just practice often, keep an open mind, and do your best.